Chris Pratt, Zoe Saldana, Dave Bautista, Vin Diesel, Bradley Cooper, Lee Pace, Michael Rooker, Karen Gillan, Djimon Hounsou, John C. Reilly, Glenn Close, Benicio Del Toro. The Best Marvel Movie submitted by crankycrack on June 27, 2015, 8:10pm and the only one that I like to watch again and again. Great Family Movie submitted by Smile1975 on July 9, 2015, 12:30pm Love this movie for myself and my family of 4 - 2 boys and 2 girls and we always have something to talk about at the end. Great entertainment for ages 39-11! Good! submitted by leenajong on July 9, 2015, 8:57pm Very entertaining with a sense of humor. Pleasantly surprised submitted by tlexcen on July 16, 2015, 3:45pm I did not expect to like this and found that my whole family loved it! Great superhero movie that was very funny too. LOVE! submitted by pooh on June 24, 2016, 3:10pm So funny! Chris Pratt is great as the lead. Groot is the best. Can't wait for the sequel submitted by JulieCraig on July 7, 2016, 6:19pm Marvel hits a home run with another exciting cartoon comic book come to life. Sci Fi and Fantasy enthusiasts will enjoy this movie. Can't wait for the sequel. Both my husband and I enjoyed it. Great Film submitted by Gina Hewitt on July 14, 2016, 5:44pm Not crazy about Chris Pratt, but this was a great film regardless. The humor was spot on. Good watch. Amazing submitted by rgaller on July 23, 2016, 4:16pm Probably my favorite of the MCU movies. great! submitted by mmckenzie on June 25, 2017, 1:20pm funny, irreverent! Something Somewhat Different submitted by Meginator on July 18, 2017, 10:23am Guardians of the Galaxy is a hilarious superhero film that completely stands alone from the other Marvel Cinematic Universe films, insofar as you can jump in without prior knowledge and fully appreciate everything (which makes it a rarity these days). The themes of friendship and family resonate deeply, the characters are well-conceived and convincingly portrayed (even the CGI is good), and the the sets are fantastic. The film is acutely aware of itself but not to the point of disrupting its flow; with a wink and a nod, the story continually rolls on. This film proves that the superhero genre can accommodate a wide variety of characters, stories, and tones, and it is absolutely delightful. Goofy fun submitted by kathscot on July 28, 2017, 12:10pm Much to like in this movie. Funny, but not mean. Lots of action. '80's music. Guardians of the Galaxy submitted by a2sue on August 8, 2017, 8:16am Guardians was OK, but nothing spectacular. Funny submitted by amandaberry on August 27, 2017, 8:40am Funny, but not much of a plot. Voices were fun and characters are cute. Will probably watch the sequels. Love it! submitted by KOH on August 27, 2017, 11:18pm Awesome action movie. Chris Pratt is so funny. Funny submitted by VanCancue on June 20, 2018, 4:13pm It was so entertaining and funny! 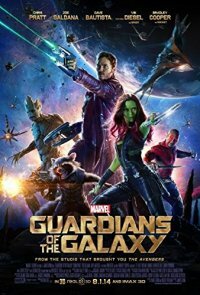 A great addition to the Marvel universe submitted by ajstemp on June 28, 2018, 1:09pm Guardians is astoundingly funny, deeply hopeful, and just an all-around great watch. It's a fun introduction to the off-Earth side of the Marvel universe, but would be worth watching if you didn't have any interest in the rest of the franchise, too. Marvel! submitted by kbahleda on July 23, 2018, 9:40am Strong movie with all the right parts. Guardians of the Galaxy submitted by SBNB on August 16, 2018, 9:45pm This movie is very sci-fi, more than the other Marvel movies I've watched. It was good though. I enjoyed it. Good submitted by anacoluthon on August 21, 2018, 7:30pm This movie doesn't take itself as seriously as a lot of superhero movies nowadays. Plus it has a great 80s soundtrack! Burbank, CA : Buena Vista Home Entertainment, 2014.